I’d never been to Lake Placid before this autumn. It’s been a dream of mine ever since the 1980 Winter Olympics (what a great time to be a proud New Yorker patriot! ), and we finally got to see some of the most scenic and beautiful landscapes in the country. While staying in the city, we wanted a hotel room that would capture the breath-taking beauty of the area. Oh, we got it! We stayed in the Panther Suite at the Golden Arrow Lakeside Resort. Wowsa! The Panther Suite is lovely. 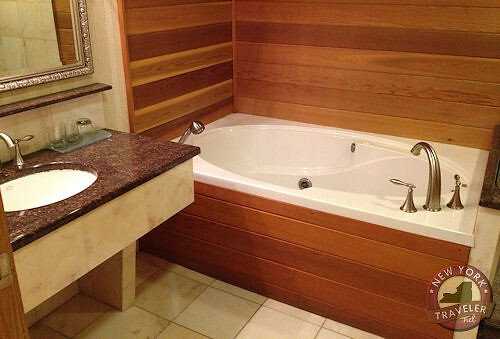 It has two very large bedrooms and one bath with a whirlpool tub and luxurious glass-enclosed walk-in shower. 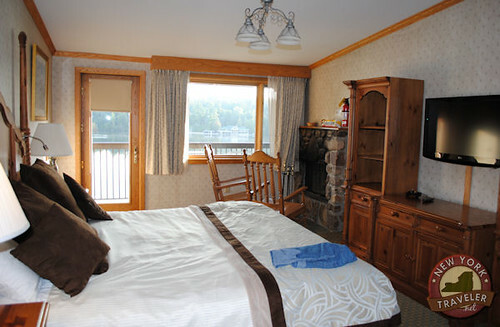 The master bedroom has a fireplace and two rocking chairs and both rooms have access to a veranda with patio chairs. 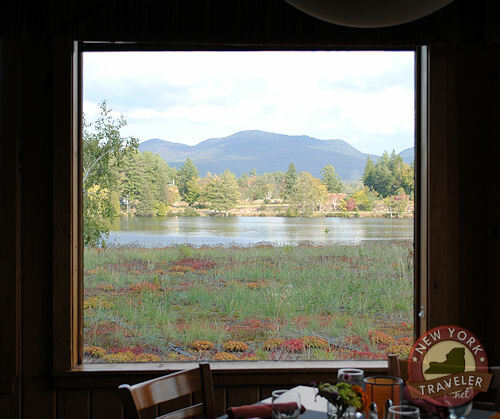 The rooms overlook elegant Mirror Lake, with Whiteface Mountain and other mountains towering over us. A family of ducks and loons populate the lake, filling the morning air with their enchanting calls. 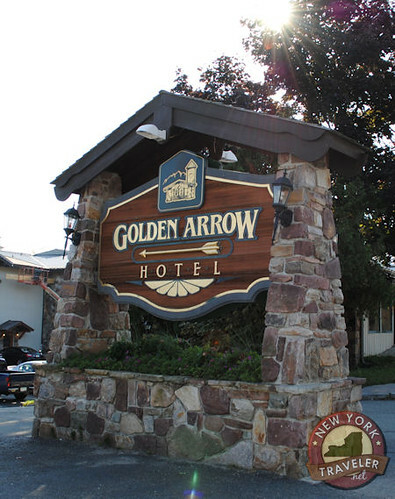 The Golden Arrow Lakeside Resort (GALR) is situated in downtown Lake Placid, nestled amongst the many small Adirondack-themed gift shops, gourmet eateries, and the Lake Placid Olympic Museum, among other things. We spent one rainy day perusing the shops and that was really fun! The story of the GALR starts in 1955. It’s an interesting story and the current owner, Jenn Holdereid, is very proud of it. Two immigrants arrived from Southern Germany to New York City, met in an English class, fell in love, and married. 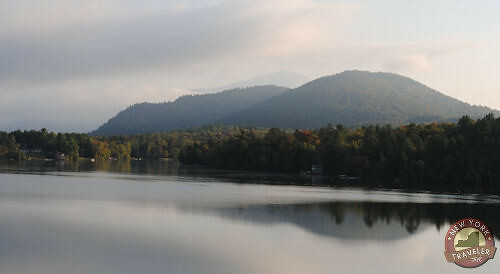 On a visit to lovely Lake Placid in 1963, they fell in love with the area (who wouldn’t?) and purchased an old 36-room motor inn a year later. The business thrived — literally exploded — under the couple’s work. The couple, Winfried and Stefanie Holdereid, and their children – Christl, Peter, Heidi and Jenn — expanded the inn into a full-fledged luxury resort. ABC News used the resort as their headquarters to cover the 1980 Winter Olympics here. Since that simple beginning, the GALR now boasts nearly 200 guests rooms, suites, specialty rooms as well as a Health Spa room, an indoor swimming pool, underground parking garage, and a lovely beach in the back. Jenn, the youngest child and now owner of the hotel, has added some illustrious new credentials to the resort, including a “green program” that has earned the resort the highest rating from the Audubon Society for its ecological initiatives. I toured the resort and saw much of the “green” programs: CFL bulbs, low-flow showerheads, double-paned windows, bamboo flooring, recycled carpeting, low VOC-paint, and more. But those are the “unseen” elements. 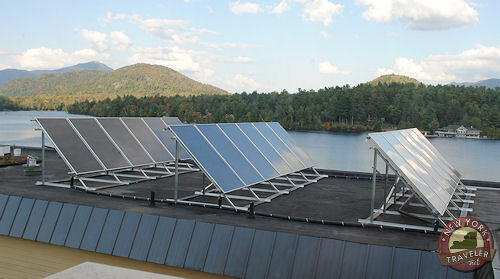 What’s really cool is the living roof, called a “green roof.” These low-growing plants help insulate the roof and also provide pedestrians with a lovely view of Whiteface Mountain and the other peaks across Mirror Lake. And I spotted the solar panels — these generate hot water so that that resort supplies all its warm water for the pool and the laundry facilities with thermally-heated water. Recycled carpeting and renewable wallpaper. Of course, very few people will stay at a hotel because it’s “green.” But I am more likely to stay at a hotel that has such policies, because it says that the business cares about the community in which it interacts. It shows that the hotel management is active and working toward a healthy and hospitable environment. In short, it shows that they care. They’re not just looking to make a buck and trash the place. This is so rare with too many businesses today. It’s refreshing to see such a hotel participate in such a program. And the hotel is also very “employee-based.” It’s a family business, so the working environment seems more open and participatory. Again, this just shows that the business cares. 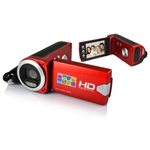 They are in this for the long haul and intend to provide an exceptional service that other places usually don’t meet. It creates a very special experience for the traveler. Pets are allowed in the resort but only in suites on one floor. The resort has an entire floor for guests with allergies, providing HEPA air filters, dust mite bed covers, bamboo flooring instead or carpeting, hypo-allergenic comforters, and more. Guests can swim in the indoor pool or swim in Mirror Lake on the beach. There are canoes and boats for paddling out on the lake. The beach has white sand made from ground limestone. This is to protect the lake from contaminants and to keep it clean and pure. The resort owns the Generations restaurant next door where the chef uses local produce. The food is amazing! Some larger suites have kitchenettes and multiple bedrooms. Get a view of the lake when you stay — you won’t regret it! The resort is open year round. When the lake freezes in the winter, guests and local residents sometimes go sledding or skating on the lake. During the winter, the resort gets a lot of business from a boys’ hockey team, and the place gets pretty busy. They also specials seasonally, too, so be sure to check the website for package deals before you purchase your cheap tickets to the area! The resort provides free Internet access. 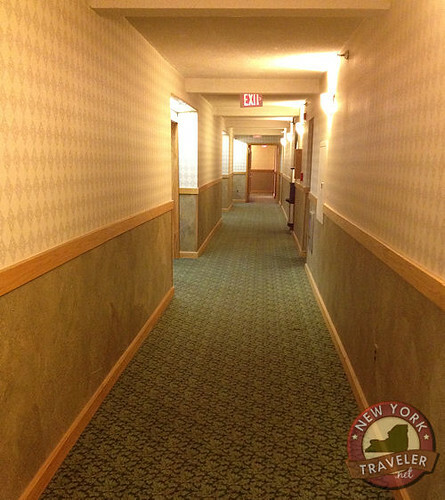 We loved our stay and were very impressed with many of the luxury amenities. We were especially impressed with the high level of energy and hospitality from everyone we met there. The hotel is beautiful, but it is FRIENDLY and relaxed, to boot. That’s what made it all special for us. We will definitely return!